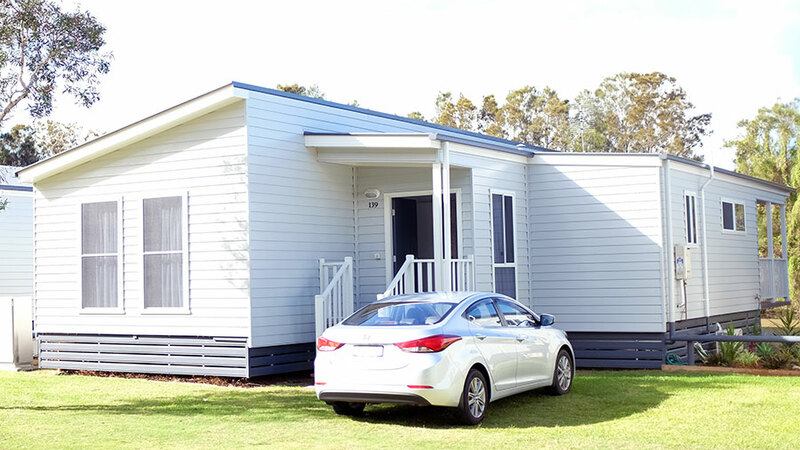 A little while back we were invited to the official relaunch of Discovery Parks Byron Bay, a prominent holiday park located on the main road into town. As the former journalist for a caravan magazine I’ve visited my fair share of holiday parks over the years, but this was a very different experience. Aside from giving us the opportunity to have a gander behind the fence we’ve driven past almost daily for the last 20+ years, the experience actually allowed us to see our hometown through the eyes of a traveller. 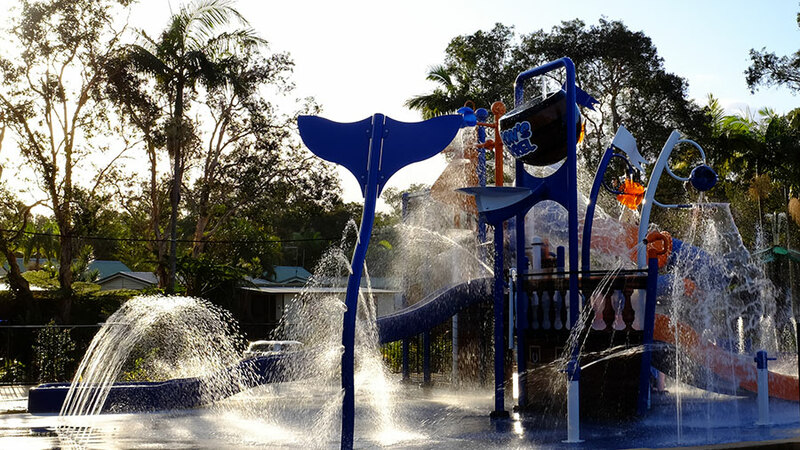 Byron has long been marketed as a family friendly escape, but after staying a night at this park and hearing the management’s take on what family friendly is and should be, it dawned on us that Byron has missed the mark for years. Once you’ve visited the playgrounds at Railway Park and Main Beach, gone for a swim at the beach, had something to eat and then browsed the shops for a while, there’s really not much else to do without spending more money. After visiting this park though, it’s clear that Byron Bay finally delivers on its promise. In a nut shell, this is Byron’s most family friendly option. 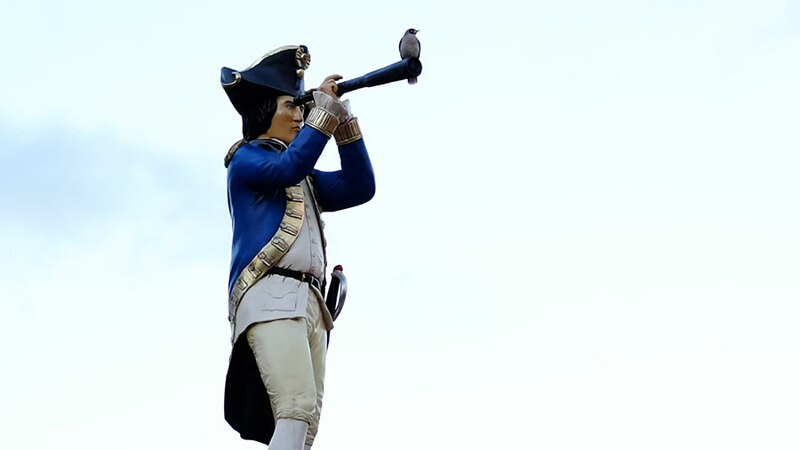 In a former life, Discovery Parks Byron Bay was known as Byron Bay Tourist Park. It was primarily a backpackers park with cheap camping and cabins, but the park of today bears little resemblance to the previous incarnation. 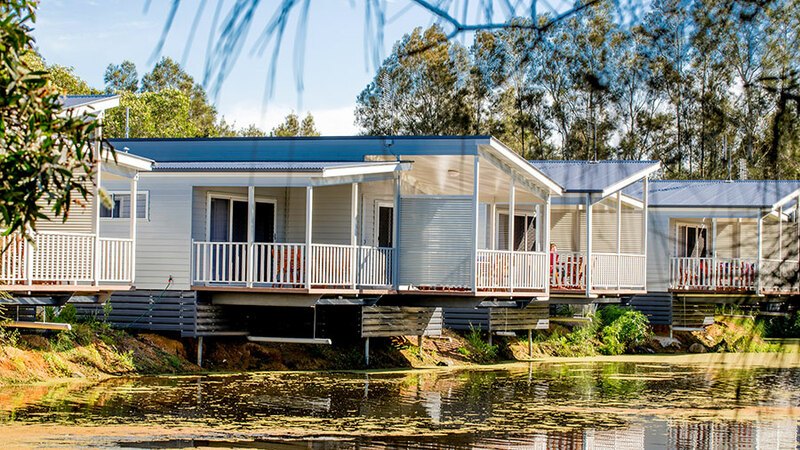 Since purchasing the property around 18 months ago, Discovery Parks have so far invested more than $8 million into reinvigorating this once tired old tourist park, helping it at last realise it’s full potential. Major additions include a kid’s water park, fenced swimming pool area and jumping pillow, as well as the just-opened Deluxe Cabins and Safari Tents. 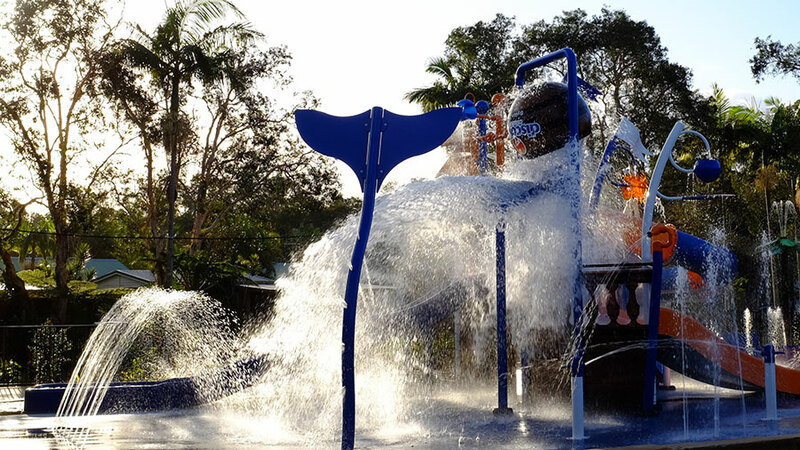 The water park is a standout allowing families to do the Byron thing by day and then head back to the park where kids can safely entertain themselves. Having a secure pin-code entry gate to the park also means that today’s parents can relax without constantly wondering where their kids are. We stayed in one of the new flagship Deluxe Two Bedroom Cabins, which are cantilevered over a small lake located at the rear of the property. 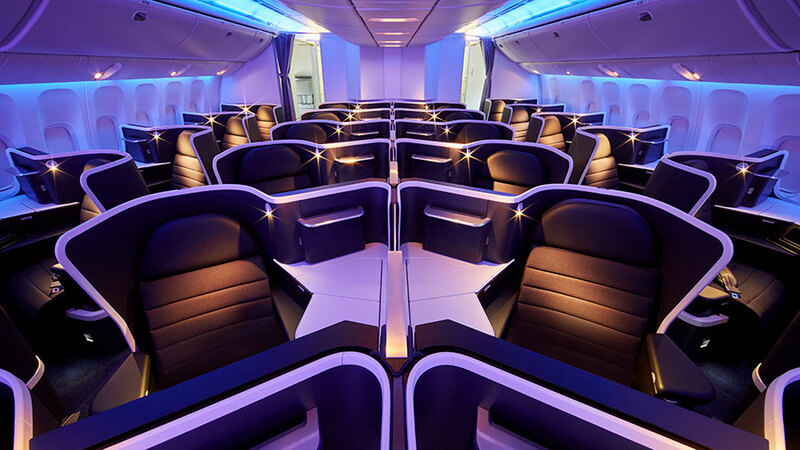 From the moment we entered, it was clear these weren’t your average cabins. In order to compete with the high-end accommodation in Byron, the cabins have been up-spec’d to feel more like an apartment than a cabin. We can gladly report there are no coral print bedspreads or orange Formica tables. Our cabin had an open plan living and dining area with L-shaped lounge and dining table, a full kitchen with microwave, oven and stove, and a deck with large outdoor setting. The whole cabin was also air-conditioned. Bedding wise, there was a double bedroom at the front and a second bedroom with two bunks, separated by a large bathroom with walk-in shower. The cabin’s decor featured a lot of white, from the walls to the kitchen cabinets and the lime washed floors, but thankfully a few vibrant artworks and cushions by local artists helped add some much-needed colour. 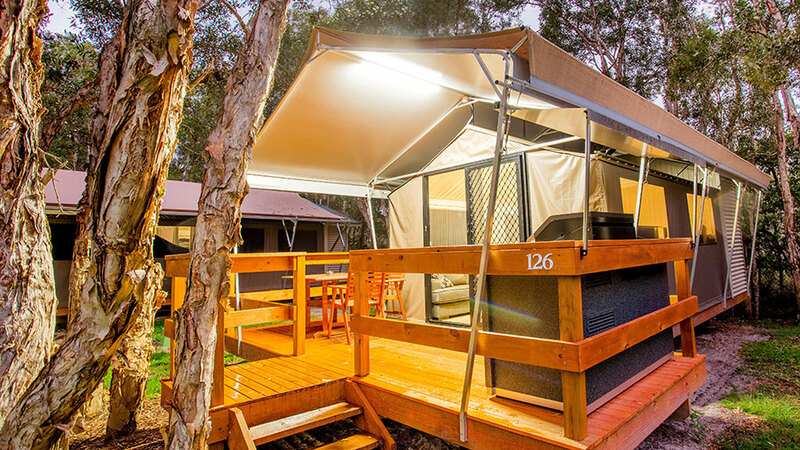 Just across a grassed camping area from our cabin were the new Deluxe Safari Tents. 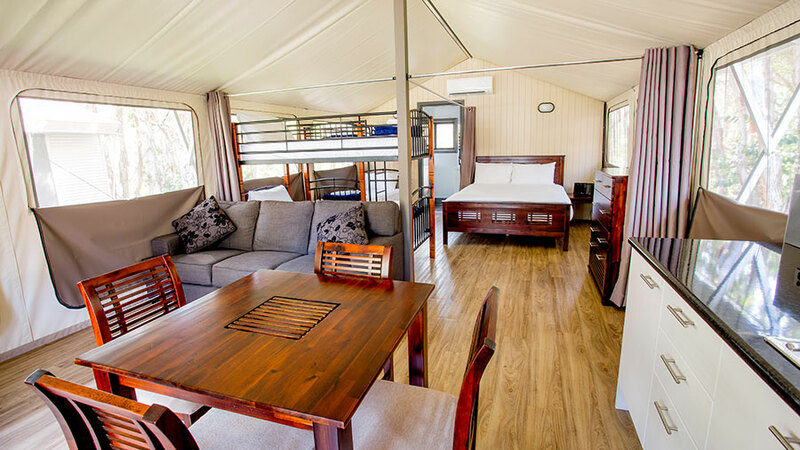 We had a quick look inside one of them and they offered some serious glamping credentials with reverse cycle air-conditioning, an ensuite bathroom, and large deck with outdoor setting and big BBQ. The thing that really surprised us though was the price tag. Both the Deluxe Cabins and the Safari Tents sleeping up to six guests start at around $150 a night, and even in high season they only go as high as around $220 a night. Our stay at the park was just one night, but it was an eye-opener. 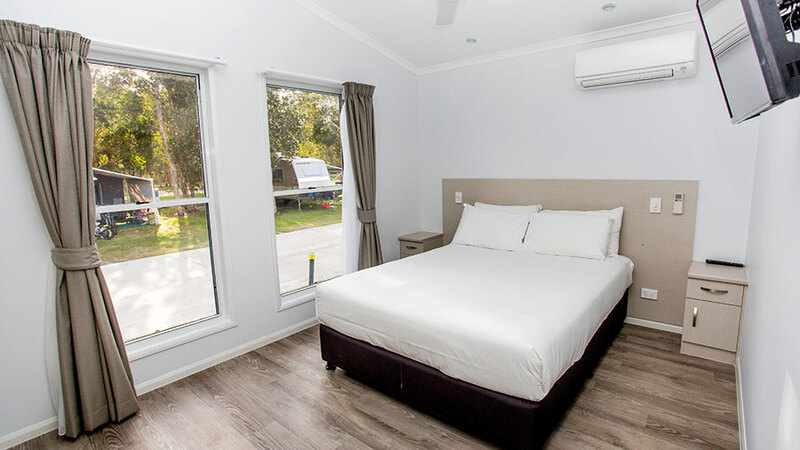 Behind the cheap backpacker accommodation that can be seen from Ewingsdale Road is a fully realised holiday park that is peaceful, quiet and very affordable. 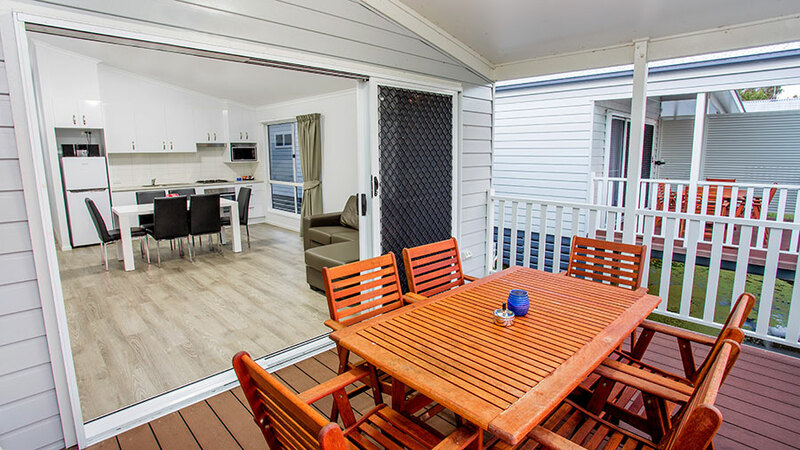 If you’re after a park to take the family without worrying how to entertain them for an entire holiday, or just want a cost effective option only a short walk from the beach and town centre, Discovery Parks Byron Bay delivers. Visit discoveryholidayparks.com.au for more info. As an Aussie myself, I love reading posts about Australia. 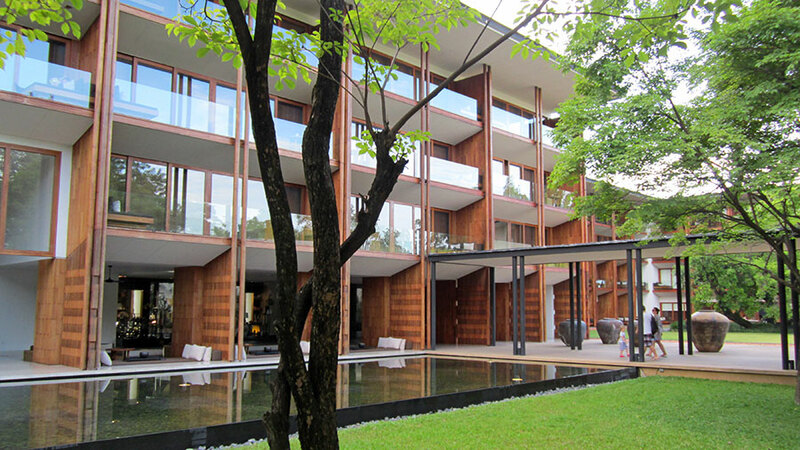 This place looks better than most hotels I have stayed around the world. I will definitely keep this place in mind if I am ever up that way. 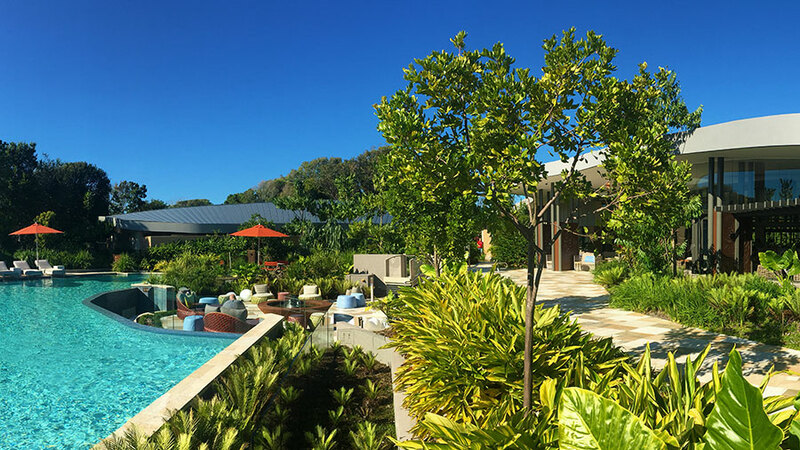 This sounds like a great place to stay in Byron Bay, and reasonably priced too. It’s the safari tents I’d love to try! We’re keen to give the safari tents a try too. They look awesome!